Brevicoryne brassicae, Cabbage Aphids, on the leafy green to some sort of cabbage growing out in the garden. I love the variation in color with this group, and I wonder if another species isn't mixed in or weather the color variance has to do with age and the type of cabbage they're feeding on. Cabbage is a cold weather crop that grows best over the autumn, spring, and moderate times of winter. It's a crop that's been selectively bread into numerous other crops. Brussels Sprouts, Kale, Cauliflower, Broccoli, and even Ornamental Cabbage used to all be the same simple growing leafy green plant. It grew in southern Europe and apparently was just a couple of leaves. It was bread around the world into the numerous varieties we have today. 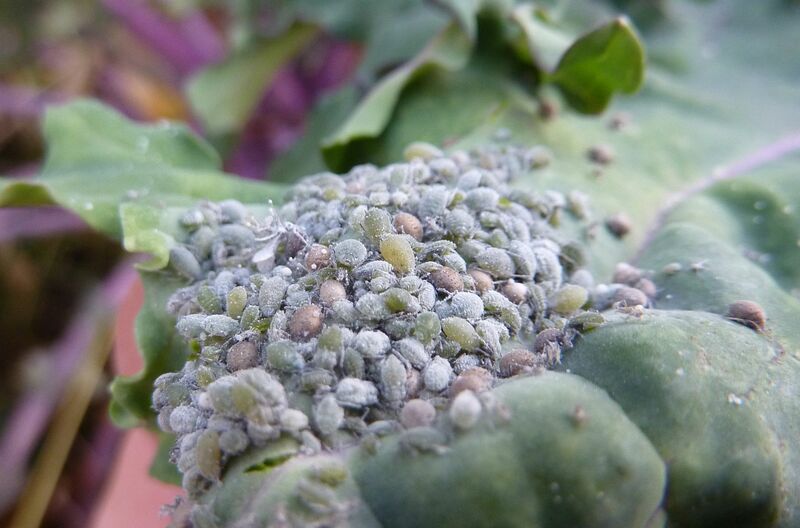 Despite this though the Cabbage Aphid still recognizes it's host plant regardless of what form it takes. Bright yellow/orange aphids on milkweed would be Oleander Aphids, Aphis nerii. If you ever grow an assortment of Rudbeckia species you'll likely get red ones but I don't know what their name is.